Matching female university students with high school girls. We are working to increase representation on a large-scale, and we have found that mentorship offers an immediate and individual solution that allows high school girls to connect with personal role models. Often older and successful role models seem elusive in their nature as they're just slightly distant from our situation. Through matching high school girls with college students, we're fostering positive contact with realistic and tangible role models. At Lab, the founding chapter, in the first year, we had 66 participants, resulting in 33 pairs of mentors and mentees. They were all matched based on similar interests and personalities that were indicated on forms that we sent out to both parties. Through consistent monitoring in the following months, we received positive feedback that exceeded our expectations and informed our practices at other chapters and for the coming years. The mentorships vary on a case by case basis, so the advice can range. We left it open-ended so that each partnership could find what worked best for them. Mentor/mentee partnerships generally meet in coffee shops, cafés, or other informal locations once to four times a quarter. This allows for a casual and mutually beneficial relationship to flourish. There is a variety of topics to be discussed during these meetings. Primarily, college/career advice, school advice, a balanced social life. Essentially, through this program, we are fostering constructive dialogue between high school girls and their mentors, who serve as peer leaders/guides. After surveys on what mentees thought were the immediate goals and what the benefits were of the program, we found a few running themes. They were both personal and professional, which speaks to the versatility of the program. 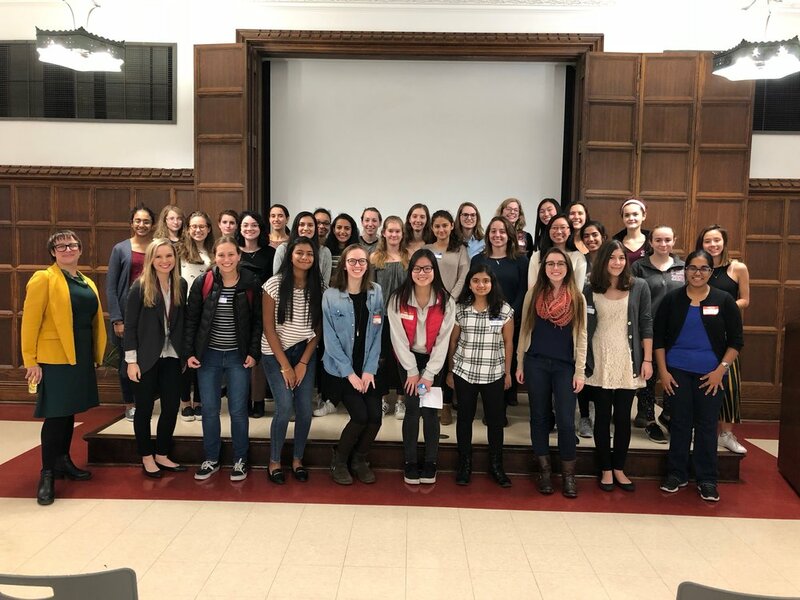 Professionally, several girls believed that this program helped them better understand the track to college and the possibilities beyond high school. Additionally, some said that they were learning more about what the experience in a work environment or research position is like. Personally, girls said that they were learning more about the process of finding a passion and sticking with it. It was also interesting for them to get to know somebody as both an individual and as an inspiration, especially because they may have never met them otherwise. Some were just excited to have a new friend! To monitor the process, we hold three events a year, with monthly check-ins. We hold a first meeting event, a halfway check-in, and an end-of-the-year celebration with all the mentorship pairings present. The chapter leaderships are all responsible for making themselves available to resolve any issues that present themselves during the process. Ultimately, our objective is to gauge and increase interest in STEM fields to lay the foundation for representation. We also just hope that the process is fun. STEM is a historically unapproachable field and women are historically less. Through this program, we hope that we're moving forward to change in the future. Meet & Greet Our first mentorship event held on Nov. 3rd at Lab, with the University of Chicago Associate Dean of Students in the Physical Sciences Division, Emily Easton, as a guest speaker.